The first Master Class was organized by the Academic University Center – University of Amsterdam (Netherlands), and held in Rolduc, a convent in the southern province of Limburg in the Netherlands, in 1999. This proved to be successful. Eminent professors of different universities in both countries were invited to teach. All accepted and made this Master Class into a wonderful experience for all involved. Meanwhile the collaboration was enlarged. A study trip of teachers and students from Amsterdam and Heidelberg / Heilbronn made contact with the training programs in Minneapolis and Salt Lake City. In 2000 a successful Master Class took place in Bad Wimpfen, in Germany. Subsequently students presented results of their own work in Hannover, where an international medical informatics conference took place. 2001 brought us a wonderful Master Class in the vicinity of Minneapolis, USA. Later that summer students presented their work on the Medinfo2001 conference in London. Furthermore, the international module on Strategic Information Management of Hospital Information Systems was organized in Heidelberg, in which students of all European partners participated. In 2002, this international module, due to its great success, became a structural course in the educational programs of all European partners. Also in 2002, Master Classes, highly appreciated by students and faculty, were organized by the University for Health Informatics and Technology of Tyrol (UMIT), Innsbruck. In 2003, Master Classes took place in the lovely scenery of Salt Lake City, Utah. The IPHIE student workshop was held at MIE2003 in San Marlo, France.In that same year, the European course on Strategic Information Management of Hospital Information Systems was attended by 59 students of the 3 European partner universities. 2004 brought us successful Master Classes in Amsterdam again, The Netherlands, attended by a 20 students and 7 IPHIE faculty members. Later that year, 8 students presented their M. Sc or PhD research during an IPHIE workshop at MedInfo2004 in San Francisco, USA. The international module on Strategic Information Management of Hospital Information Systems was prolonged for a another year. In 2005, we spent 3 days at the impressive 13th century Grussau monastery of the medieval town of Bad Wimpfen, Germany. The Master Classes were attended by 19 students and 6 IPHIE faculty members. The European course on strategic information management of hospitals was organized in Amsterdam, The Netherlands. More than 70 students of the European partner universities and of the University of Brownschweig participated in the course, which again was highly appreciated by both faculty and the students. Finally, 7 IPHIE students presented their MSc/PhD research project at the Medical Informatic-Europe conference, held in Geneva, Switzerland. 2006 brought us exciting masterclasses in Minneapolis again. Over 30 faculty members and students participated in this event. Later that summer IPHIE students presented their research at MIE2006 conference in Maastricht. Again, the monastery of Bad Wimpfen became the location of 2011’s Master Class. Some of the highlights were visits to the Ion Beam Therapy Therapy Center in Heidelberg and the Neurosurgery Department at the university hospital of Heidelberg. Besides the various subject-related tasks and activities, the group enjoyed the historical sites and surroundings of Heidelberg and Heilbronn. An open-air wine tasting took an unexpected but unforgettable turn, when it ended in heavy rain showers in Heilbronn’s forests. Everybody had a laugh about it afterwards when the group regathered for a traditional Swabian dinner in a local restaurant. In 2014, The IPHIE 2014 Master Class was hosted by IPHIE new member, Taipei Medical University. This event was held for five days, providing a series of academic conferences, courses lectures and seminars to promote exchange between international students and faculties from IPHIE partners. 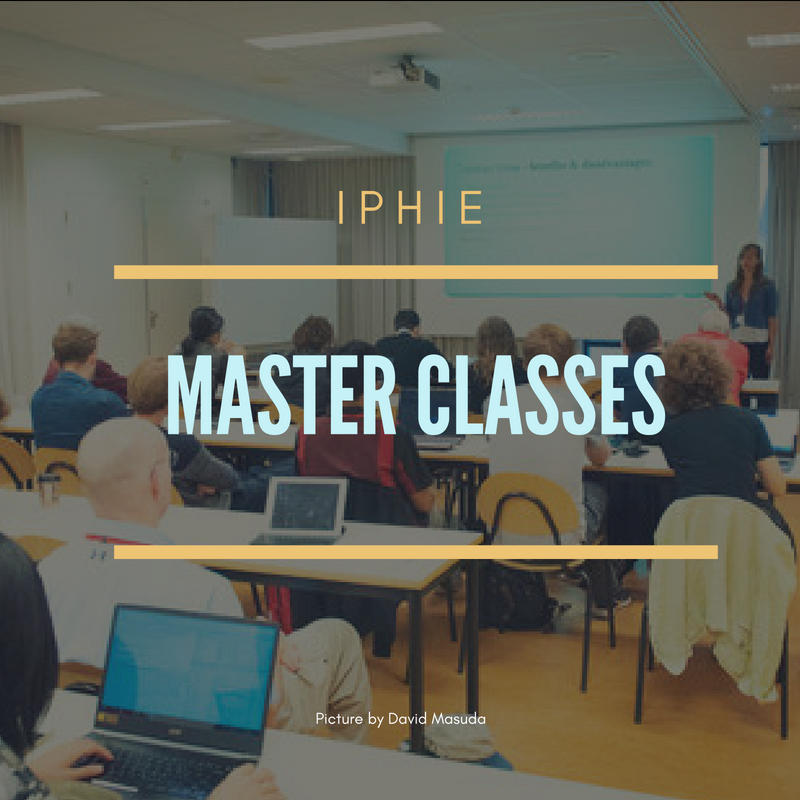 IPHIE 2016 was organized by University of Utah and the latest IPHIE MasterClass was again held in Amsterdam by the pioneer of IPHIE, University of Amsterdam. Around 11 faculty member and 23 students from 6 universities across the US, Europe, and Asia attended this event. Not only presenting their own research project, we also assigned the student to perform some machine learning techniques for disease prediction within five days. The organizers also brought all of the participant to visit several IT industry that succeed in implementing teemedicine and EHR integration in the Netherlands.